With summer's highly anticipated arrival and these intermittent bursts of beautiful weather, I can't help but feel excited, like a kid awaiting the six weeks holidays from school! There is an undeniable happiness that comes with fresh summer days, the desire to enjoy picnics with friends and walks along a sun drenched beach. For me, I reach for my trusty steed and whisk myself away, taking in the sights and sounds, blowing the cob webs out and enjoying the freedom of mind that comes from riding my bicycle! To celebrate my affection with my beloved bike, and this most fun- filled season, I have gathered a gorgeous selection of wheelie wonders! All hail the bicycle bell with attitude! 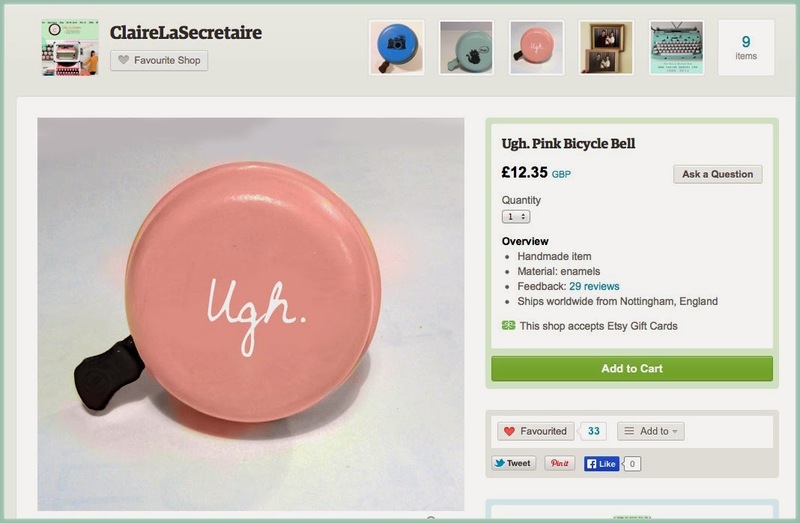 This fabulously sassy bell comes from the glorious mind behind Claire La Secrétaire shop on Etsy.com, not only do they sell accessories for your ride, they also offer reconditioned 1950's typewriter... Oh that's right, IN BUBBLE GUM PINK! I'm saving up for one of those, perhaps the mint green one? I digress. If you're after some seriously snazzy pieces to brighten your day, then look no further, plus they ship world wide with great prices to boot! This cute, printed fabric caught my eye for obvious reasons, and although I continue to promise not to add to my undeniably over grown material stash, just look at this sweet pattern! My mind races with the possibilities! (Pun totally intended). For the avid stitchcrafters out there, if you've yet to visit The Homemakery then you're in for a real treat! If you're already a fan, then you'll know just how much of a treasure trove this web site is! It caters to all your crafty needs, and even those you never knew you needed ; ) Wonderfully friendly, diverse range of pieces and a delightfully designed site, you can do no better than The Homemakery. But please, allow me to purchase a roll or two of this cotton before it runs out! And for my grand finale, step forward the ever faithfully jam- packed with beauties Sugarhill Boutique! Now, I understand that by sharing this with you, I may run the risk of it flying off the cyber shelf before I get my grubby mitts on it, (especially since it's now in the sale! ), but proving my dedication to you my dear friends, I just had to reveal it. 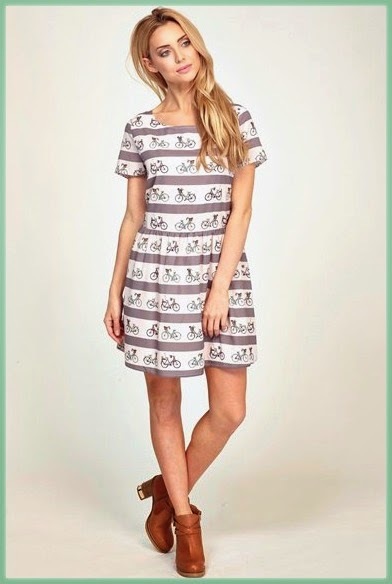 Sugarhill Boutique; fashion bloggers delight, boasting high quality garments, with unique spins on the latest trends and fabulously affordable pieces- and now a bicycle print dress! 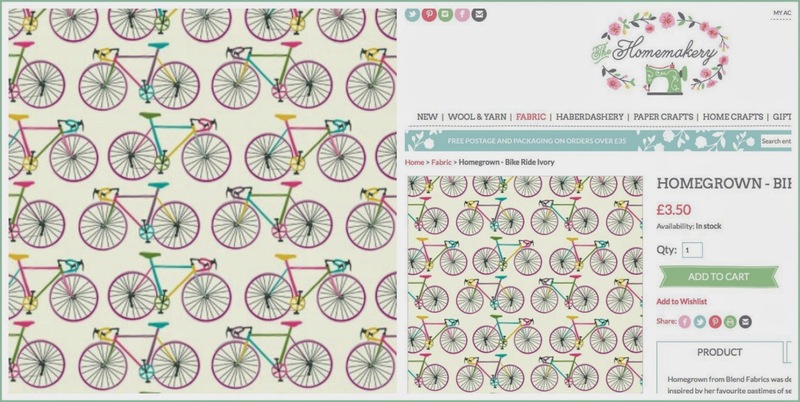 I really can't seem to get enough of this cheerful pattern, and can envision an entire summer spent zooming around Holland, kitted out entirely in bike themed lovelies! Ah well, in the words of the infinitely glamorous Mae West "Too much of a good thing can be wonderful." What are your favourite activities to do when the weather is just right? It's been way too long since I had a picnic, I think that's going on the 'to do list' immediately!! I love the bike fabric. My bike got stolen when I moved house, was so heartbroken - I wish I still had it, but have to save up for a new one now. Oh no, you're joking?!! That's awful. There are some rotten people about, aren't there?! Thanks Hannah! The bicycle bell is super cute huh! What a great selection! 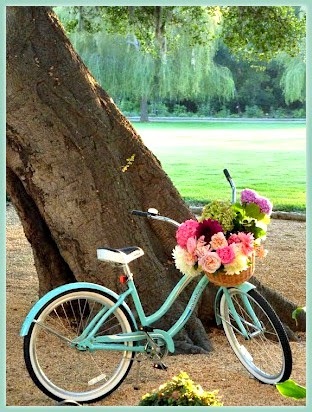 I miss riding a bike - maybe as the weather is a bit nicer here (for now!) I'll dig my bike out again. Is the title of this post inspired by First Aid Kit by any chance?...I've had their song, which has that line in it, My Silver Lining on repeat! Yeah you should! But please be careful if you cycle on the road; I never thought twice about it before really, until landing in Holland with the bike paths and everyones awareness of cyclists! It's ridiculously therapeutic! Besides the obvious benefits of saving money (no more car tax/ insurance!!) and keeping a bit fit (got to balance out all those stroopwafels! ), I've seriously found that a little whiz on my bike clears my mind. Really works a treat for stress-heads or worriers like my wee self! 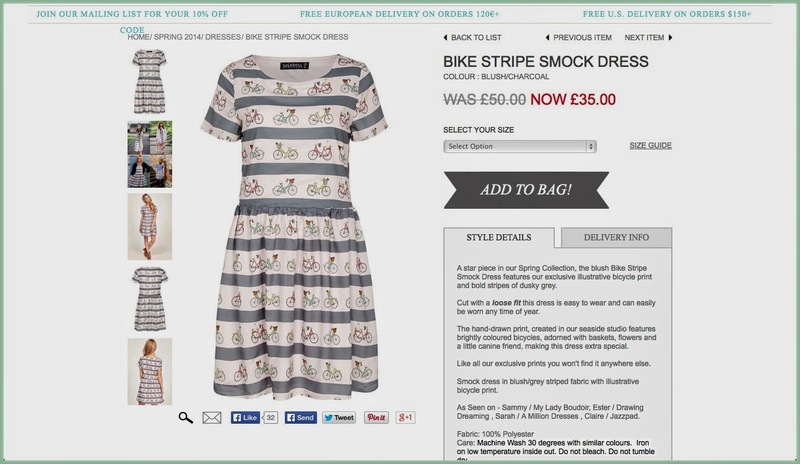 I'm ready for summer and I seriously need that bike stripe dress!